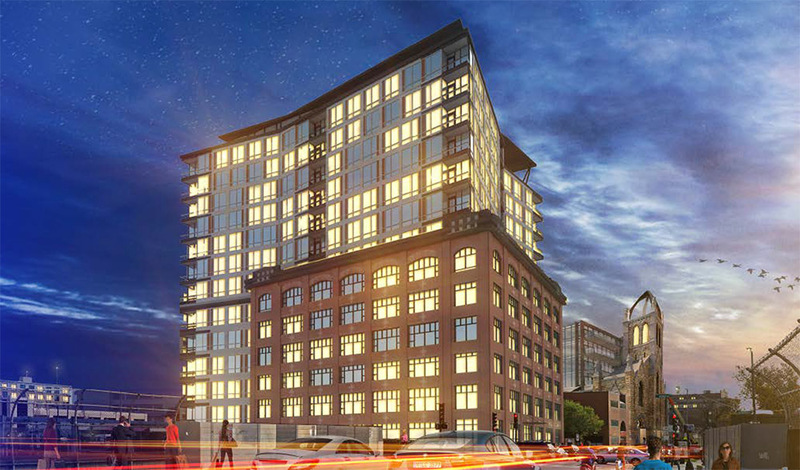 M&T Bank closes $105 million financing for development of 100 Shawmut Ave.
Boston, MA M&T Bank has closed on $105 million of financing for the development of 100 Shawmut Ave. by The Davis Companies. The existing class B office building will be redeveloped and expanded to a luxury condominium building. M&T’s real estate capital markets group syndicated the $105 million senior construction loan with support from four local banks: Berkshire Bank, HarborOne Bank, Needham Bank, and Bank of New England. “The Davis Companies has a strong plan for this development and we think the conversion of this building into luxury residential units will be a nice addition to the neighborhood. M&T Bank has a long history of establishing close relationships with our commercial clients to finance successful projects and we look forward to further opportunities with our growing client base in New England,” said M&T Bank market president Tim Wade. The property is situated within the city’s South End, close to the Financial District, Back Bay, and South Boston. The proposed redevelopment will incorporate the existing six-story structure with an expansion of a new building that will rise an additional seven stories above the current improvements. The existing building’s 1930’s façade will remain as-is, featuring excellent floor-to-ceiling height, superb window lines and city skyline views. Once completed, the building will consist of 138 luxury condominium units with residential amenity spaces, and a three-level enclosed garage containing 110 parking spaces.